Thomas Schreiner is professor of New Testament Interpretation at Southern Baptist Theological Seminary, pastor of Clifton Baptist church in Louisville, Kentucky, and author of many well-received books. 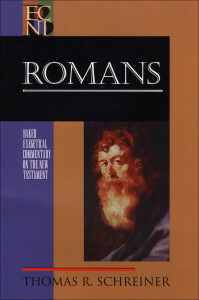 For some, his commentary for Romans will need no introduction as it is over a decade old now and very popular; in that case, I am writing to you by way of reminder (Rom 15:15)! For others, it is my joy to introduce and recommend this work to you. 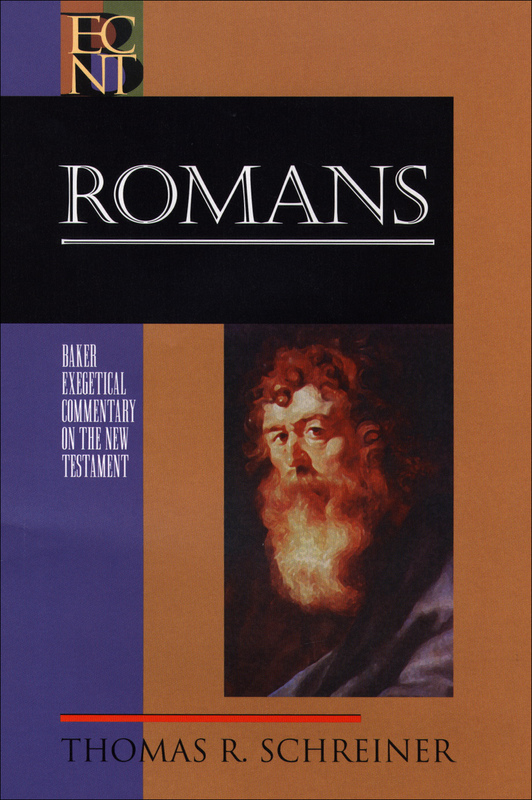 Schreiner’s Romans is in the Baker Exegetical Commentary of the New Testament, a solidly evangelical series that aims to “blend scholarly depth with readability, exegetical detail with sensitivity to the whole, attention to critical problems with theological awareness” (p ix). A standout of this series is an exposition focused on the paragraph as a unit of thought and an aim to unpack the argument of the entire section, not merely comment on individual verses. Other newer series, such as NCCS and ZECNT, have noticed the strength of this approach and are adopting something similar. Each larger unit begins with a shaded section that gives the “big thought” of the passage and explains how the verses connect to one another. Schreiner is particularly strong in tracing the argument of the text, and as someone who uses (and delights in!) BibleArc, I found this extremely helpful. One can easily get lost in the forest of Romans for all the trees; on the whole, Schreiner ably avoids this by keeping the larger context always in focus. Rom 2:6-11 “cannot be dismissed as hypothetical” (p115) but rather describe what is true of believers. One is not saved by works but Spirit-empowered works have a confirming purpose in the final judgment. Rom 2:14-16 describes Gentiles who, despite not having the Mosaic law, still at times obey moral law (conscience). Rom 3:22 should be translated “faith in Christ”, rather than “the faithfulness of Christ”. Rom 5:12-13 teaches that Adam passed on physical and spiritual death to all, so that all are born in death, which causes all to sin. Rom 7:7-12 describe Paul’s past experience of the law, which also bears similarities to both Adam and Israel’s experiences. Rom 7:13-25 continue to describe Paul’s pre-conversion experience with the law, not his current life in Christ; although believers can identify at times. Rom 8:28-30 teach individual election to salvation based on God’s prior choice (foreknowledge describing an electing relationship). Rom 9 teaches unconditional individual election to salvation. Schreiner is clearly a Calvinist, and while this shows up throughout his commentary, on the whole it does not feel unnecessarily imposed on to the text. Rom 11:26 refers to “a great ingathering of Jews near the end of history, after the full number of Gentiles have entered into the people of God” (p619). This may happen with the second coming of Christ or precede it. Schreiner is not a dispensationlist and believes in one people of God. Rom 14-15:6 present a problem between primarily Jewish Christians (“the weak”) and primarily Gentile Christians (“the strong”) regarding Jewish scruples. While both options are permissible and Paul holds “the strong” to take the higher ground, Paul sides with them theologically and sees the weak as “deficient” (p713) in faith. This deficiency is a “failure to understand salvation history…[having] not yet completely grasped the implication of faith in Christ” (p714). I’ll gladly say it right off the bat: Schreiner’s Romans was a delight to work through as I taught Romans this year and I highly recommend it. Let me offer a few words as to why and also a few smaller criticisms or concerns. First, Schreiner is thorough and fair in his representation of other interpretations of disputed passages. In fact, he was so fair that at times he helped convinced me of a different view to his own because of how well he represented it! Schreiner, despite being firm in his own views at times, isn’t afraid to offer the best of his opponents’ arguments or be hesitant to come down hard on a difficult issue. This is what we should all hope for in a commentary. Schreiner engages with the New Perspective on Paul, mostly through interactions with James Dunn. He sometimes expresses agreements with aspects the view has “recovered” but is mostly antithetical without being unfair. By nature of the commentary approaching 20 years of age, the more recent developments in the NPP and post-NPP debates (Doug Campbell, for instance) and other hot topics like empire will be missed. As to the style of the BECNT series, a few comments are in order. Unlike many series that give clear verse-by-verse commentary, Schreiner is free to tackle verses in different order or spend a number of pages giving a bird’s eye view of the passage before commenting on individual verses. This has its strengths and weaknesses depending on what one will want from a commentary. If one wants to “dip in” or see the comments on a particular verse, they may have a hard time doing so! However, it is in helping the reader understand the flow of thought and the larger context that this approach shines. Individual verses are best understood in their context anyway, so this approach is very useful; but one must really read the comments on an entire section to utilize it. This style rewards readers for using it as their primary commentary but will turn others away from using it as a “secondary” resource to dip into from time to time. Schreiner’s emphasis on the glory of God as Paul’s ultimate aim is welcome and puts the issues behind Romans in a larger context. Paul is not merely interested in a united Roman church and frontier missions as ends in themselves, but rather because they bring glory to the God of the gospel. On this note, Schreiner is as doxological and pastoral throughout as one can be in an academic commentary. One can recognize that Romans has a personal impact on him and is not merely an ancient document to analyze but a life-changing message about what God has done and is doing for His people. While I didn’t agree with all of Schreiner’s conclusions, the commentary as a whole is absolutely fantastic. I read virtually every word of this tome, but it was far from a chore. Schreiner has offered an outstanding work on Romans that (mostly) isn’t showing its age. So why this commentary? I would certainly recommend this work as a baseline commentary that one primarily works with, using others to see different viewpoints or for different purposes, such as a more pastoral-focused commentary. Comparing to a few similar works, this is longer than Kruse’s (PNTC) and, despite having many conclusions in common, it takes a broader approach than Moo’s due to the BECNT approach. Students, teachers and pastors will all benefit from this work. I can only add to the chorus of endorsements for Thomas Schreiner’s Romans.